This feng shui ten HUM with magic syllable is a powerful tool to protect one against malevolent afflictions from 8 different direction and overcome life obstacles. It is beneficial to keep one away from office politics and lawsuit, protect one from premature and unnatural death. 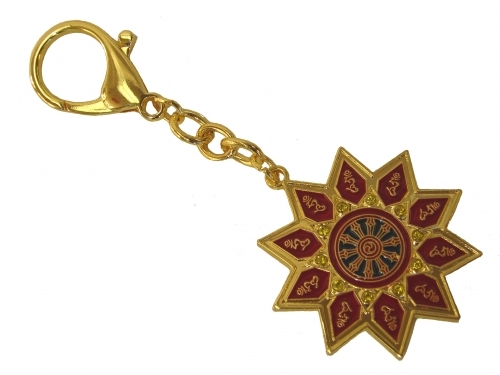 One can carry this feng shui protection amulet keychain with him throughout the year. The dimension of the ten hums with magic syllable keychain is approx. 1.75" in diameter. The overall length is approx. 4.5". It is made of alloy.